Sergei Mozer is a Deputy Head of the Division of Advanced Customs Technologies of the Department of Customs Legislation of the Eurasian Economic Commission. He is also a Contact Person for Communication with the World Customs Organization. From 1996 to 2011 he took different posts in public authorities of financial control and Customs service. Since 2011 he has been working as a Senior Researcher in the Research Institute of the Russian Customs Academy. His professional activity deals with cooperation with the World Customs Organization, improvement of customs legislation and trade facilitation issues, customs technologies. Professional and scientific interests: Eurasian Economic Union, World Customs Organization, international law, customs law, customs technologies, Single Window mechanism, AEO, trade facilitation, case law of the Court of Justice of the European Union in customs. In 1996 he graduated from Moscow institute of entrepreneurship and law, later in 2010 — from the Russian Customs Academy, where he got his Ph.D. in legal science. Currently Sergei Mozer is carrying out a dissertation research (doctoral theses) devoted to the theme: «Improving the theoretical and legal framework of customs regulation in the Eurasian Economic Union in the context of interaction with the World Customs Organization». Mozer Sergei. Improving the legal institute of digital customs: an analysis of the WCO Maturity model // Problems of Economics and Legal Practice №. 2, April 2019. (submitted for publication to the magazine). Mozer Sergei. Approaches of the World Customs Organization to the formation of a legal institute of electronic customs // Collection of materials on the results of the II All-Russian Scientific and Practical Conference «Economic Strategies of the EEU: Problems and Innovations”. Russian University of Peoples’ Friendship. Moscow, April 11, 2019 (submitted for publication). Mozer Sergei. Formation of the institute of electronic customs (e-customs) in the World Customs Organization // Social and political science № 2, April 2019 (submitted for publication to the magazine). Moser Sergei. Topical issues of the formation of the institute of digital customs in the Member States of the World Customs Organization: report // International Scientific and Practical Conference «Actual problems of customs in the digital economy». The Russian Customs Academy. Lyubertsy, April 18, 2019. Moser Sergei. Development of the digital customs institute of the World Customs Organization within the frames of international customs cooperation. 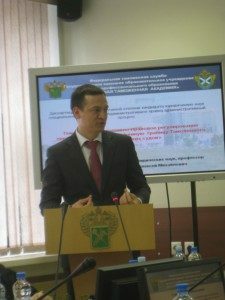 Lecture-discussion for students of the Customs Faculty, the sub-direction of education «International cooperation of customs administrations». The Russian Customs Academy. Lyubertsy, April 18, 2019. Mozer Sergei. Actual issues of revision of the International Convention on the Simplification and Harmonization of Customs Procedures within the framework of Interaction between the Eurasian Economic Union and the World Customs Organization // II All-Russian Scientific and Practical Conference «Economic Strategies of the Eurasian Economic Union: Problems and Innovations». Russian University of Peoples’ Friendship. Moscow, April 11, 2019. Mozer S.V. Current issues of customs regulation: the experience of the World Customs Organization: report // X International Scientific and Practical Conference «Russian Customs Academy — 25 years: results and prospects», November 28, 2018, Lyubertsy. Mozer S.V. Report on research work on the theme «The legal status of international organizations and other stakeholders in the World Customs Organization». – 84 pages // Russian Customs Academy, Lyubertsy, 2018. Mozer S.V. Modernization of customs regulation instruments in the Eurasian Economic Union in the context of the interaction of the Eurasian Economic Commission and the World Customs Organization: open lecture. Institute of Law and National Security of the Russian Presidential Academy of National Economy and Public Administration, November 19, 2018. Mozer Sergei. Methodological approaches of updating the Revised Kyoto Convention: report. Revised Kyoto Convention Management Committee (19th Meeting, 12 – 13 November 2018), WCO Headquarters, 2018, Brussels, Belgium. November 12. Read. Mozer S.V. Kadyrkulov M.A. Report on research work on the theme «Customs regulation in the Member States of the Eurasian Economic Union (retrospective analysis and areas for improvement)». Russian Customs Academy, Lyubertsy, October 1, 2018. – 237 pages// Archive of the Research Institute of the Russian Customs Academy. Kadyrkulov M.A., Mozer S.V. Improvement of instruments of customs administration: international and legal aspect (The Revised Kyoto Convention Management Committee): monograph / MA. Kadyrkulov,S.V. Mozer. Moscow: Publishing House of the Russian Customs Academy, 2018. – 248 pages. Read. Mozer Sergei, Ph.D. Improving customs regulation in the context of the WTO Trade Facilitation Agreement: lecture / Moscow International Model of the World Customs Organization, the Russian Customs Academy — 2018, March 20th 2018, Lyubertsy. Read. Mozer Sergei. Improvement of customs regulation in the Eurasian Economic Union in context of interaction between the Eurasian Economic Commission and the World Customs Organization. IV International forum of the Financial University «What the future is preparing for us». Moscow, November 29, 2017. Mozer Sergei. Eurasian integration at present stage: customs aspect / Open lecture for the students of the International Finance Academy of the Russian Academy of Foreign Trade of the Ministry of Economic Development of Russia / Eurasian Economic Commission, 16.10.2017. Mozer Sergei. Actual issues of interaction between the Eurasian Economic Commission and the World Customs Organization in the field of customs regulation / Open lecture for the students of the International Finance Academy of the Russian Academy of Foreign Trade of the Ministry of Economic Development of Russia / Eurasian Economic Commission, 09.10.2017. Mozer Sergei. Methodological approaches to improve the legal institute of the authorized economic operator in the Eurasian Economic Commission member states: financial solvency (Report) / Meeting of the Subgroup of the SAFE Working Group, Brussels (Belgium), the WCO Headquarters, September 12, 2017. Read the theses. Kadyrkulov M.A., Mozer Sergei, Lipatova N.G. Report on a research work: Study of the role of the World Customs Organization as a modern institution for improving of customs regulation and trade facilitation. The Russian Customs Academy, 2017. Kadyrkulov M.A., Mozer Sergei. The Directorates of the World Customs Organization: Simplification, Compliance and Institutional Development. // Scientific Notes of St. Petersburg Branch of the Russian Customs Academy (sent to be published, June 2017). Mozer Sergei. World Customs Organization: history of creation, areas of activity and structure / report. («The Moscow International Model of the World Customs Organization», The Russian Customs Academy (Lyubertsy, April 24, 2017) [submitted to be published]. Sekerbaeva D.K., Mozer Sergei. Topical issues of the development of a «single window» mechanism in the Eurasian Economic Union in modern conditions. («Moscow International Model of the World Customs Organization», Russian Customs Academy (Lyubertsy, April 24, 2017). [submitted to be published]. Kadyrkulov M.A., Mozer Sergei. Prospects for the development of relations between the Eurasian Economic commission and the World Customs Organization // Academic Bulletin of Rostov Branch of the Russian Customs Academy No. 3 (24), 2016.-C. 5-8.). Read. Goshin V.A., Mozer Sergei, Lipatova N.G. Report on a research work. Investigation of the problems in customs (code «Customs-2015») on the topic «Study of the activities of the Court of Justice of the European Union in the proceedings of cases in the customs sphere with the purpose of improving of lawmaking and judicial practice in the Eurasian Economic Union in the field of customs». Russian Customs Academy, Lyubertsy, December 2, 2015. Mozer Sergei. «Legal Innovations of the Customs Code of the Eurasian Economic Union»: report / meeting of the Club for Logistics and Foreign Trade of the Finnish-Russian Chamber of Commerce, Moscow, December 23, 2014. Participation in the research work «Conducting research in the field of theoretical and methodological bases for the application of the risk management system in the customs service of the Russian Federation, taking into account the standards of Chapter 6 of the General Annex to the International Convention on the Simplification and Harmonization of Customs Procedures» (cipher «Harmonization»). Russian Customs Academy, 2014. Mozer Sergei. Actual aspects of customs regulation in the Customs Union at the present stage: processing procedures // «Customs and Science — Customs and science». — Wednesday, 23 October 2012. Read. Mozer Sergei. The powers of customs authorities as agents of currency control. Judicial practice // «Customs and science — Customs and science». — 07.12.2012. Read.